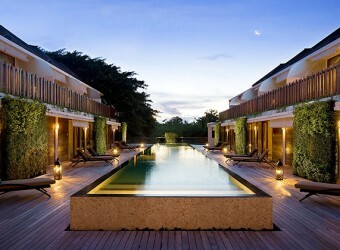 Bali Hotel Kupu Kupu Jimbaran is a 3 storied building boutique hotel opened on April 2011. It is the sister hotel of Kupu Kupu Barong Villas in Ubud and The Sandhi Phala in Kuta (former Kupu Kupu Barong Beach Resort). The 1st floor is restaurant, café and shopping mall, and 2nd floor is the spa that is produced by L'OCCITANE, Bamboo Spa. All rooms are luxury suite type. A hotel with a great atmosphere, I felt like in another dimension since entering hotel area! The room designed in French style other than Balinese style. And, the first floor is a shopping area, I bought wine and cool souvenirs.